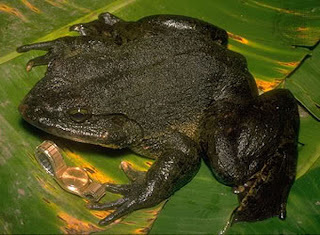 Animal Wildlife | Goliath Frog | The Goliath Frog is the biggest frog in the world. They have been popular as food from a long time ago. They are also caught to keep as pets or for their skin, and their numbers have gone down to half of what they were before. This animal has a relatively small habitat range, mainly in Cameroon and Equatorial Guinea. Its numbers are dwindling due to habitat destruction, its collection for consumption as food and its collection for the pet trade. The goliath frog is normally found in and near fast-flowing rivers with sandy bottoms in the West African countries of Cameroon and Equatorial Guinea. These rivers are usually clear and highly oxygenated. Their actual range spans from the last 200 km of the Sanaga basin in Cameroon to the north to the last 50 km of the Benito River basin in Equatorial Guinea to the south. 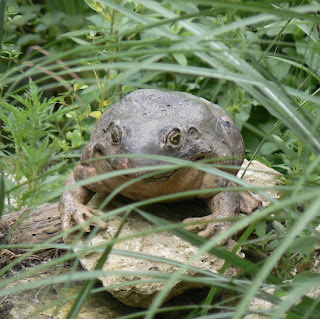 The river systems in which these frogs live are often found in dense, extremely humid areas with relatively high temperatures. The goliath frog can live up to 15 years in the wild. In captivity, they can live up to 21 years. While male Goliath frogs weigh up to 8 pounds, females can weigh up to 7. These frogs have acute hearing but no vocal sac, and additionally lack nuptial pads. 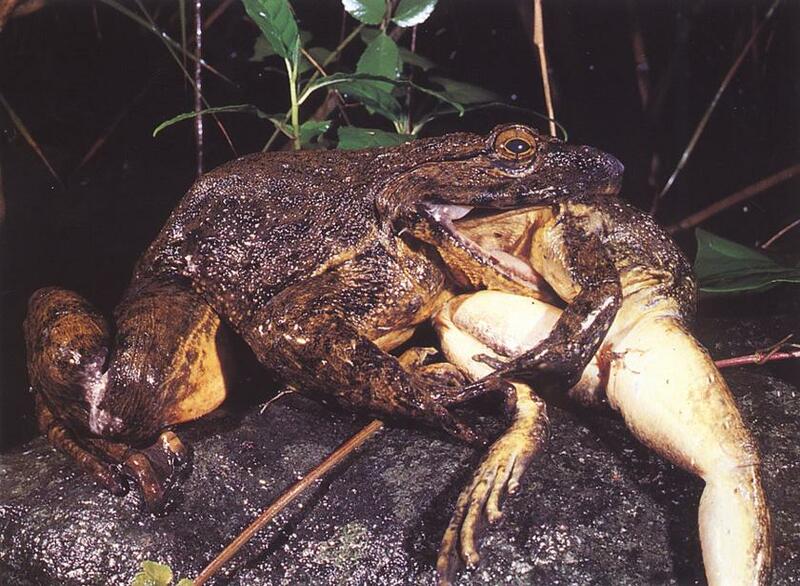 The goliath frog, like most frogs, feed on worms, and insects, such as dragonflies and locusts. 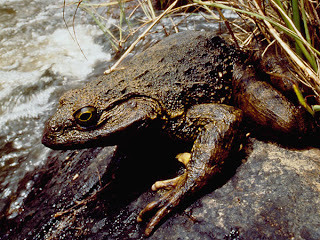 Bees and wasps could be prey, but since they have stingers they use as a weapon, the goliath frog rarely even catch one. Goliath Frogs also eat smaller frogs, largely crabs, baby turtles, and young snakes. 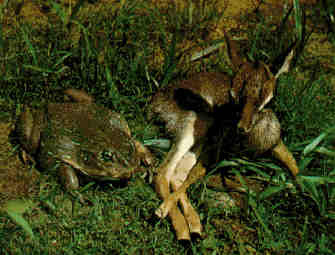 The goliath frog is also preyed on by snakes, Nile crocodiles and Nile monitors. Like all amphibians the water is vital for their reproduction. The males will construct spawning and breeding areas alongside and within rivers by pushing rocks into semicircular patterns. Not much is known about the goliath frog's reproduction; however, some African scholars have started to do more research for medical reasons. 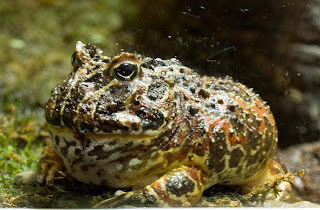 They are the biggest frogs in the world. As tadpoles they are pretty small, and become frogs about 1.4cm in length. Once they become frogs they get bigger little by little. The increase of people in the Goliath Frog's living space has become a problem. First, the spaces where they can live have become fewer. Also, Goliath Frogs are skilled swimmers and live near rivers. Because of people, the rivers have started to get dirtier, and the frogs are no longer able to live in a safe environment like before. 0 Response to "Goliath Frog"